His ban came into effect on Tuesday morning. The Chief Minister reached the Hanuman Setu temple and recited the Hanuman Chalisa. He did not respond to questions by the media. Union Home Minister Rajnath Singh also reached the temple around the same time to offer prayers before filing his nomination. Rajnath Singh later went to the party office from where he will proceed to file nominations in the District Collectorate. 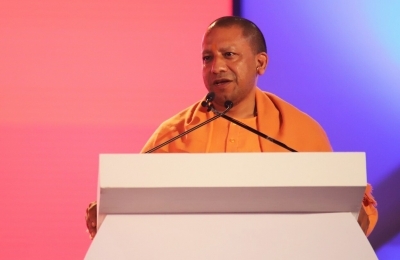 Adityanath is facing the ban by the EC for saying that if 'Ali' belonged to the Samajwadi Party-Bahujan Samaj Party alliance as claimed by BSP supremo Mayawati, then the BJP enjoyed the blessings of â€˜Bajrangbali'.